In the past, children have been the focus of the Friends of Hemlock Bluffs' Nature Program Scholarship Fund. Over the years, the program has improved and expanded to provide educational opportunities for other groups in need as well. The goal of the Fund is to provide nature programs at the Preserve to a variety of groups who may be socially, economically or mobility disadvantaged. The programs are offered for the purpose of fostering a love of nature, raising environmental consciousness, and encouraging environmental conservation and protection. We hope that the benefactors of the programs will become more engaged with their natural environment through the augmented understanding and positive personal experiences that the program provides. Our education program includes personal encounters with nature (indigenous animals, plants and natural processes) a staff-led educational session, hands-on activities, and an opportunity to experience time outdoors in the environment. 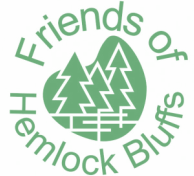 The trained educators at Hemlock Bluffs determine the curriculum and teach the group, and the Friends of Hemlock Bluffs provide funding for the program and any associated supplies. The target audience for these scholarships are citizens, both children and adults (including seniors), who do not normally have access to the Preserve whether that is due to funds, transportation, social issues or mobility. Experience has taught us that there are many individuals who can benefit from additional hands-on field study in biology, ecology, and earth science to become better stewards of the environment. 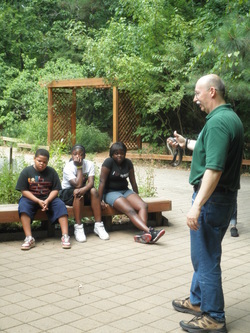 We try to seek out groups that wouldn't otherwise receive this opportunity and offer this outdoor experience to them. Recipients of the program in the past have included; Head Start, Helping Hand Mission, the Raleigh Rescue Mission and most recently, the Triangle Aphasia Project. If you know of any group in need of this type of programming, please notify the Friends at fohbsecretary@gmail,com or mention it at the Stevens Nature Center, the next time you are visiting the Preserve. Join us, be active and do good in your community!